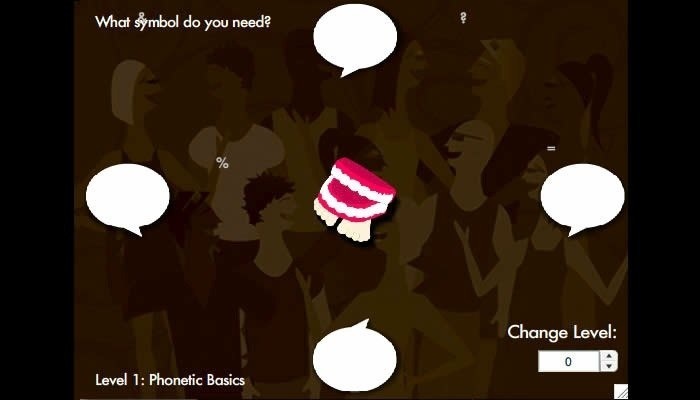 Borrowing its game engine from an earlier challenge game ‘Jazz By Ear’, Phun With Phonetics helps students practice visual recognition of the symbols that make up the International Phonetic Alphabet. The students hear a sound clip representing an IPA symbol and must steer the chattering teeth to the correct symbol before the clock runs out. The game loads sounds randomly, and offers increasing levels of cognitive difficulty to help students throughout the entire semester. This entry was posted in Game, Interactive, learning activity, Music and tagged fine arts, flash, phonetics, speech pathology, theater, voice by Britt Carr. Bookmark the permalink.